As our governments reconvene for their yearly climate talks, society is being changed by people taking grassroots action all around the world. For over twenty-five years, the world’s nations have gathered yearly to talk about how to halt the breakdown of the Earth’s climate. Despite these decades of well-meaning international discussions, fossil fuel use has never been as high as today. This year’s climate conference is taking place in the German city of Bonn, but few of the key players have made concrete commitments to deliver the transformative change needed. The real planning for a safe and just transition is taking place not in the conference halls, but by people organising in community halls, coffee shops and their living rooms. Germany—despite its reputation as a leader in the energy transition—is still relying on coal to cover a quarter of its electricity demand, and plans mine expansions until at least 2040. On the fringes of the UN climate summit, social movements are organising their own responses to the failure of politicians to address this crisis with urgency. With a group of young people from Scotland, I travelled to Bonn to attend events such as a ceremony held by Pacific islanders, the People’s Climate March and various other workshops. 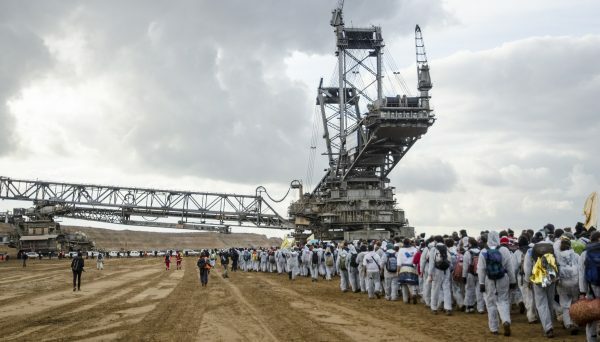 We also joined 4500 others in a mine occupation organised by the German collective Ende Gelände, peacefully stopping the production of coal for the day. Three months ago, the extent of my political involvement was to retweet well-meaning politicians or sign online petitions. Now I had committed to do more to create change, together with thousands of others, by taking direct action. Having attended various trainings the day before and having formed an ‘affinity group’ with friends, I felt supported and confident in our ability to undertake this mission. What was especially startling about this action was the diversity of its participants: young and old; experienced activists as well as novices like me; people from the global North and South. This wasn’t just Germany’s problem, it was all of ours. Several hours after the occupation started, we came to a group consensus to walk out of the mine together. But despite our peaceful intentions, police forces attempted to break our formation by pushing us, isolating and arresting individuals, and using pepper sprays and horses. Singing, chanting and dancing helped us to keep our spirits high and face these intimidation attempts united. As we stood, arms locked and singing in front of the police line, the hypocrisy of the official climate talks was even more apparent. As our governments busied themselves with interminable negotiations, their police were repressing the real action that their citizens were undertaking to protect our planet. It is encouraging to know we can physically stop perpetrators of the climate crisis—even for just a day. It seems evident that we will not succeed solely by slow-moving, unambitious talks by our state leaders. Pressure must come from acting locally and empowering people to organise in their communities. Different groups across Scotland are working in multiple ways to undermine the power of the fossil fuel industry, and they need all the help they can get. The mass shutdown of a mine sends a powerful message, but this is just one action. Now what we need is day-to-day organising work, allowing people to take ownership of the fight against climate breakdown. A version of this article appeared in The National on Monday 13th November 2017.